Dr. Jessica Davis, DC is your Chiropractor Huntsville AL. 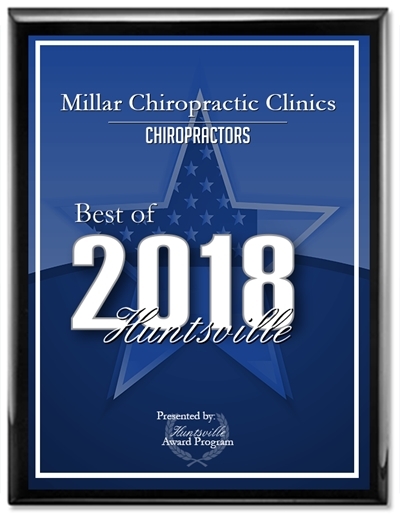 Under her direction, Millar Chiropractic - Huntsville AL (Jones Valley), or as our patients like to call us Millar Chiropractic Jones Valley is a one of the Best Chiropractors in Huntsville having received the Best of Huntsville, Chiropractor Award 2018, 2017 and 2016. 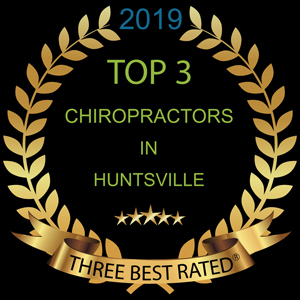 Dr Jessica Davis also received the Best 3 Chiropractor Award for Huntsville for 2019. Millar Chiropractic Jones Valley is one of 6 Millar Chiropractic Clinics serving Madison and Huntsville Alabama. We have brought together knowledgeable compassionate Doctors, "State of the Art" equipment and a helpful caring staff. We've been open in Jones Valley since 2008 offering more access to our South Huntsville patients. Over 5000 Huntsville Alabama residents have become our patients company wide so far. We're accepting new patients. We welcome you to "Chiropractic Excellence." 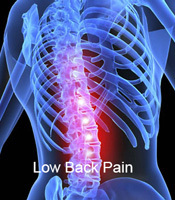 We are your complete spine care center. 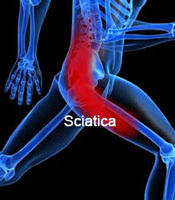 We offer chiropractic adjustments (manual and instrument), spine treatment, Joint treatments (foot, knee, hip - shoulder elbow wrist and hand), massage, physiotherapy, and State of the Art equipment like laser, and decompression traction, plus custom exercise programs, complete rehabilitation and the latest soft tissue treatments. Dr. Jessica Davis DC, is the Senior Millar Chiropractor at the Jones Valley clinic She is an in network provider with BCBS , Fed BCBS, PeeHip, and Medicare and accepts most insurance. Dr. Jessica and her team have the "Knowhow" to get to the root cause of your problem and fix your problem. We have "State of the Art" equipment like the Millar Facet & Stenosis Table, DTS - Decompression Traction; Lasers; and Disc Pump. 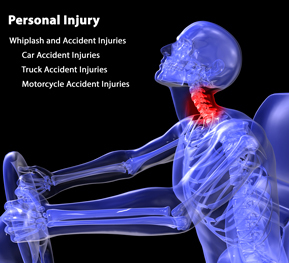 If you need a chiropractor or spine treatment in Huntsville Alabama call us today. Office hours Mon through Fri 8am - 12pm & 2pm - 6pm. Closed daily from 12-2pm. 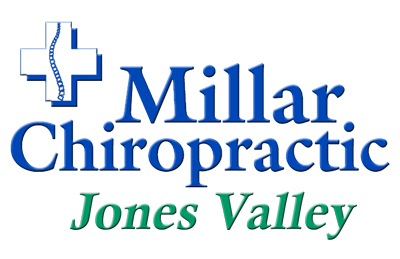 Equity Partner Millar Chiropractic Jones Valley, LLC. As a Huntsville Al chiropractor, we understand the unique needs of our patients. Many of our patients are current or former NASA engineers or their family. We understand the unique needs of the engineer patient offering published researched data to support practice conclusions. On the other hand we treat many south Huntsville AL moms and family who only want what is best for their family without drugs or surgery. Natural health care with state of the art equipment. 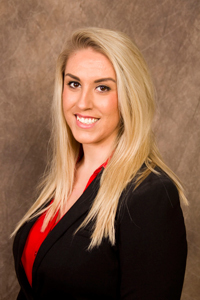 Dr. Jessica Davis, DC| Chiropractor is the Senior Millar Chiropractor at Millar Chiropractic Jones Valley. She is not only the Senior Millar Chiropractor for this clinic but she is the CCD - Chief Clinic Director for all Millar Chiropractic Clinics. She brings that wonderful patient knowhow experience to each patient. Dr Jessica, as she likes to be called, practiced and interned under Dr Millar at the Millar Chiropractic - Huntsville (Jones Valley) before taking over as the Senior Millar Chiropractor at this clinic. Dr Jessica uses many techniques such as Activator, Atlas Orthogonal, and Manual Thompson techniques. The patients rave about her adjusting skills and quality care. Dr Jessica likes to say, "If your a hammer then everything is a nail; but, if you have many adjusting tools in your tool box, you choose the one that fits the patient." Dr Jessica likes to treat all kinds of Chiropractic problems from Arthritis to Zinc Deficiency. 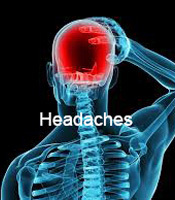 But, she specializes in 1) Low Back Pain with or without disc involvement, 2) Neck Pain with or without disc involvement, 3) Headaches and Migraines, 4) Sciatica, 5) Join Pain (shoulders, elbows, wrist, hands | hips, knees, ankles, feet) and 6) Personal Injury auto accidents. She utilizes onsite physiotherapy and complete rehab. Dr Millar went on to say, "Dr Jessica seems to have that 6th sense on just how to treat each patient to produce the best results possible and help them with their condition. That can't be taught. It has to be learned over time." It is Dr. Jessica's goal to help patients achieve a pain-free life without having to rely on drugs and surgery. The Jones Valley patients rave about her adjustments. You will too. Please call (256) 713-1830 for an appointment. We are accepting New Patients. 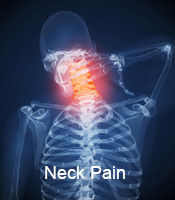 We also offer a nationwide toll free number of 1-800-462-4476 (800 Go Chiro) for our appointment center. At the Jones Valley clinic we have the DTS - Decompression Traction System and the Millar Facet & Stenosis Table. We also have in office X-ray and physical therapy modalities such as e-stimulation, ultra sound, and laser. Compassionate Healing in a State of the Art Practice. We will work closely with your medical team as well. That gives you the best of both worlds. Doctors you already know and trust working with new Alternative Doctors willing to bring to the table new ideas and thinking. In fact we like to say "We Are The Alternative to Drugs and Surgery". See for yourself. 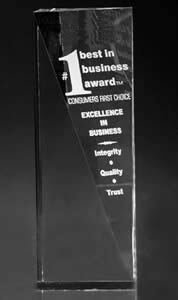 Millar Chiropractic Jones Valley was the recipient of the #1 Best in Business Award, Chiropractor, for Huntsville and North Alabama for the past five years. Wow what a streak. We were also awarded the 2018, 2017, and 2016 Best of Huntsville, Chiropractor. Dr Jessica was personally awarded 2019 Top 3 Chiropractors In Huntsville. Millar Chiropractic Jones Valley, LLC. d/b/a Millar Chiropractic - Huntsville AL (Jones Valley). Each office independently owned and operated and practices as a separate group practice. Chiropractor Huntsville al, Millar Chiropractic - Huntsville al (Jones Valley), chiropractic Huntsville, chiropractor huntsville, milar, miller chiropractic, Huntsville Al chiropractor, Huntsville Al chiropractors, neck pain, low back pain, joint pain. Millar Chiropractic - Huntsville AL (Jones Valley) has taken "The Pledge" We pledge that we will not offer long term contracts. We will only offer that care needed by each patient. Chiro-Trust members are a group of Doctors of Chiropractic worldwide who are dedicated to provide conservative, mainstream Chiropractic care, without sales pressure, long term contracts, unnecessary therapies or excessive cost.